Our bedrooms are our most private and personal sanctuary, intended for sleep and the other “S” thing we do there. But if your drawers are overflowing, the floor is in disarray and clutter covers your bed, you’ll wake up frazzled and more tired than before you went to bed. It’s time to declutter your bedroom and take back your sleep sanctuary. Focus on your bedroom’s function — rest, relaxation and renewal — with some simple DIY organization hacks guaranteed to help you arrange and declutter your bedroom for maximized sleep. Opening your closet to be bombarded with a wave of clothes is a nightmare. 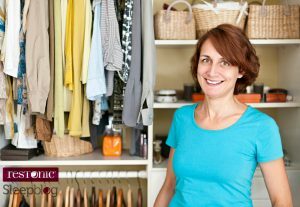 Instead of throwing, piling and rummaging, try these easy DIY closet organization tips and bring back the sweet dreams. Wardrobe cleanse – This bedroom storage hack might sound stressful but don’t fret, you got this. Completely empty out your closet and get rid of anything you haven’t worn in 6 months. Be ruthless. If you don’t wear it, donate it. Excess is organization’s nemesis. Haul your donations to your nearest Goodwill Donation Center. Ring your scarves – The floor is no place for scarves. Grab your extra shower rings, string them on and place on a hanger or on your closet door. Hang with a plan – Randomly hanging clothes in your closet doesn’t mean you’re organized. Hang pants in one area and dresses in another. If you’re really keen on getting organized, break it down by length, occasion or season. Color code – Once you learn how to hang with a plan, arrange everything by color. 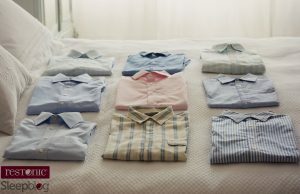 Yes, this seems tedious but when you’re in a hurry and looking for a specific shirt to match your look, you’ll find it in no time. Hook your suitcases – Opening your closet and being hit with a ginormous suitcase is not good. Grab some hooks and hang your suitcases on the back of the closet. This will be much easier when packing for your next trip. Dresser drawers are similar to a closet full of clothes in that we tend to cram in as much as we can. When a dresser is disorganized, it’s difficult to find anything fast but, since we can easily hide the mess, it’s the last thing we tend to organize. 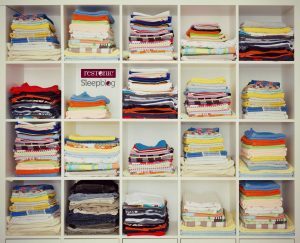 Here’s some bedroom storage tips to help streamline your morning routine and maybe even catch a few extra winks. 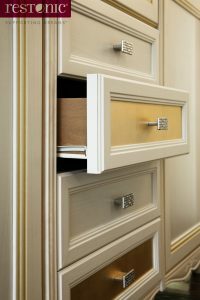 Divide and conquer – Treat your dresser drawers similar to the filing cabinet at work. Label multi-colored dividers and separate everything from socks to t-shirts. Your dresser will be color-coded and super organized. Scented drawers – Have you ever opened your dresser and got a whiff of stale air? Freshen up your dresser by placing scented candles or soap in them. Trunk it – Is your dresser is stock piled with misc. shirts (like when you ran that 5k years ago) that are there purely for their sentimental value? Next time you’re at a yard sale, look for a trunk and store it in front of your bed and neatly place all those random shirts in it. Do you want to wake up with dirty underwear on your face or an earring poking your eye – didn’t think so. It’s time to rest easy and create an ultimate sanctuary in and around your bed. easily be stored under your bed. Dual duty – When selecting bedroom furnishings, look for solutions that will add storage and extra space to your sleep sanctuary. A bed headboard that doubles as a bookshelf or throw a pillow on a cedar chest for seating. Hang your accessories – A jewelry box is a great place for stylish accessories but a piece of unfinished plywood and strung with hooks can hang on your wall as a jewelry keeper. Your bedroom is your sleep sanctuary, not a laundry room. A key step to setting the tone for better sleep in your bedroom is to declutter and organize. When your bedroom is clean and clear, you’ll be more likely to fall into a destressed sleep and wake up well rested. Perfect, right?